Paper piecing is a simple stamping technique that allows you to add quick detail to your stamped images and uses those precious patterned paper scraps we all hoard. Let's look at how easy it is to incorporate Paper Piecing in your paper crafted creations! Today's video will give you a brief tutorial into how to paper piece. Stephanie gives you a simple step-by-step to achieve this fun result! Watch the video below or click here (MFT Tips & Tricks - Paper Piecing) to watch it on YouTube. Don't forget to subscribe to our YouTube channel so that you don't miss a single tutorial! The sky's the limit when it comes to paper piecing. You can use any patterns your heart desires or even card stock. And your trusty markers can add dimension and details if you like! This is just one of ten Tips & Tricks videos on our MFTv YouTube channel. Check out the other nine HERE. Let's take a look at a couple of other delightful ways to use the paper piecing stamping technique! 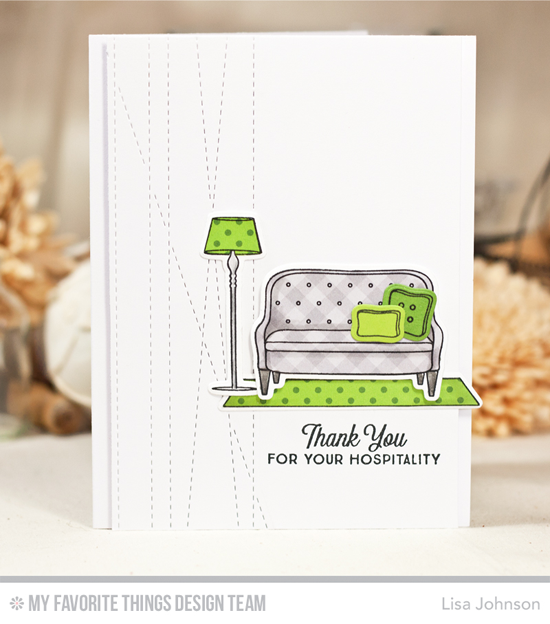 Lisa used the brand new Make Yourself at Home stamp set to create this delightful paper pieced scene. I'd love to sit a spell in the light of that cute green polka dotted floor lamp! 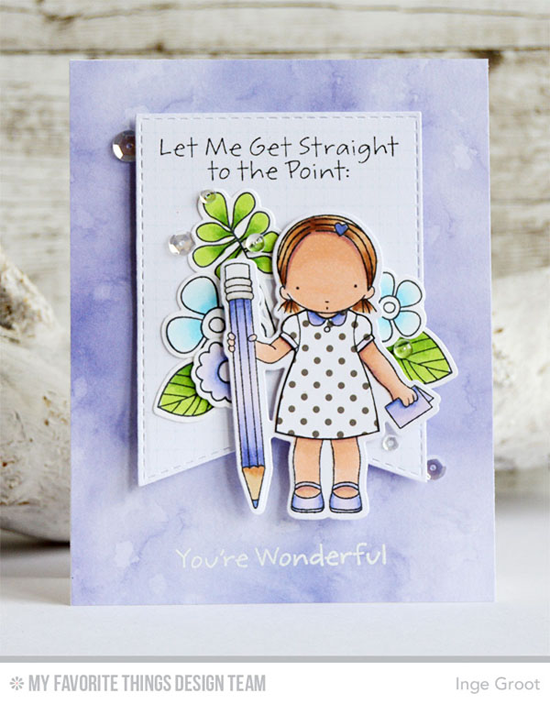 Inge added a pretty polka dotted dress for the giant pencil-wielding cutie from the Straight to the Point stamp set and Die-namics. I love how she added some lavender to the collar of her dress with a marker for extra detail and to tie it into the rest of her design. You will LOVE paper piecing. If it's been awhile, why not resurrect the technique, and if you've never tried it before, here's your chance! We can't wait to see what you create! Be sure to tag #mftstamps when you post your projects online. We can't wait to see what you've made! Before you go, take a look at a complete list of the patterned paper packs that you can buy at the My Favorite Things online store to get started paper piecing today! Simply click on the photo to be taken directly to the product. If the product is currently out of stock, you can sign up for an email notification once it's back in stock! Thanks for the video! I want to try this now.